A study published just recently in the New England Journal of Medicine shows that the age-cohort-specific incidence of dementia has actually been in decline over the period from 1977 through 2008. For quite a while now, experts have warned that Alzheimer s and other forms of dementia are going to trigger a healthcare apocalypse in the United States. As baby boomers reach their 70s, when the likelihood of developing dementia spikes upward, the ever-growing number of patients was predicted to overwhelm the healthcare system. Does the new data mean that the worst forecasts of a looming dementia crisis in the U.S. are overblown? Sadly, no, since last year the Alzheimer s Association reported that one in three Americans, aged 85 and older, had Alzheimer s. It is obvious that as more people live to 85 and beyond, one-third of a bigger number will mean a lot more people with the disease. What it may mean is that the rate of increasing dementia patients will not be as rapid as feared. The article, which is entitled "Incidence of Dementia Over Three Decades From the Framingham Heart Study," was authored by six researchers from the Boston University Schools of Medicine and Public Health, led by Claudia L. Satizabal, Ph.D. The data were derived from the Framingham Heart Study, an ongoing cardiovascular study of residents of the town of Framingham, MA, which began in 1948. Dementia is the leading cause of dependence and disability in the elderly population worldwide. As average life expectancy increases, the prevalence (total population burden) of dementia is expected to increase significantly. Today about 5.3 million Americans have Alzheimer's, and one in three elderly people die with dementia. A few prior studies have suggested that the age-specific incidence of dementia (i.e., the risk of newly-diagnosed dementia at any specific age) might be decreasing, but these studies have shown a trend that failed that has not reached statistical significance. Since such temporal trends are best derived through continuous monitoring for new cases in a representative community-based sample over an extended observation period, and with the use of consistent diagnostic criteria, the authors selected the well-documented, large Framingham cohort to test their theory. (Participants were excluded from the analyses if they were younger than 60 years of age, did not attend examinations in which involvement in an inception cohort was established, or had preexisting dementia). 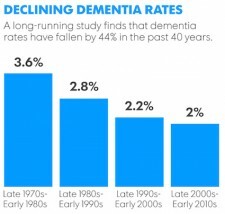 Rates of dementia in the new study decreased from 3.6 percent during the first time period, to 2 percent during the final "epoch," an astounding drop of 44 percent. The incidence rate of vascular-related dementia fell faster than other types, including Alzheimer disease, which the authors attributed to improved cardiovascular risk factor treatments and trends (less smoking, hypertension, and elevated LDL cholesterol levels). "We ve been preaching for years that what s good for the heart is good for the brain," said Ronald Petersen, director of the Mayo Clinic Alzheimer's Disease Research Center and the Mayo Clinic Study of Aging, told USA Today. This is reinforced by the fact that dementia and heart disease rates only declined among people who had at least a high school diploma, according to the study. Research has long linked higher incomes and educational levels with better health. The bottom line here is that although the B.U./Framingham team did a good job of ensuring that the drop in dementia was real, and not an artifact of changing diagnoses, it must be pointed out that the Framingham cohort is overwhelmingly white and therefore not representative of the racial and ethnic diversity in the United States as a whole. The results might therefore not extend to the entire population. Also, attributing the decline, at least in part, to better cardiovascular health also makes sense, offering hope that more cases can be prevented or delayed.